A soft and elegant, hand lettered sympathy card. This pretty sympathy card makes the perfect choice for sending your love and support to someone special during a difficult time. 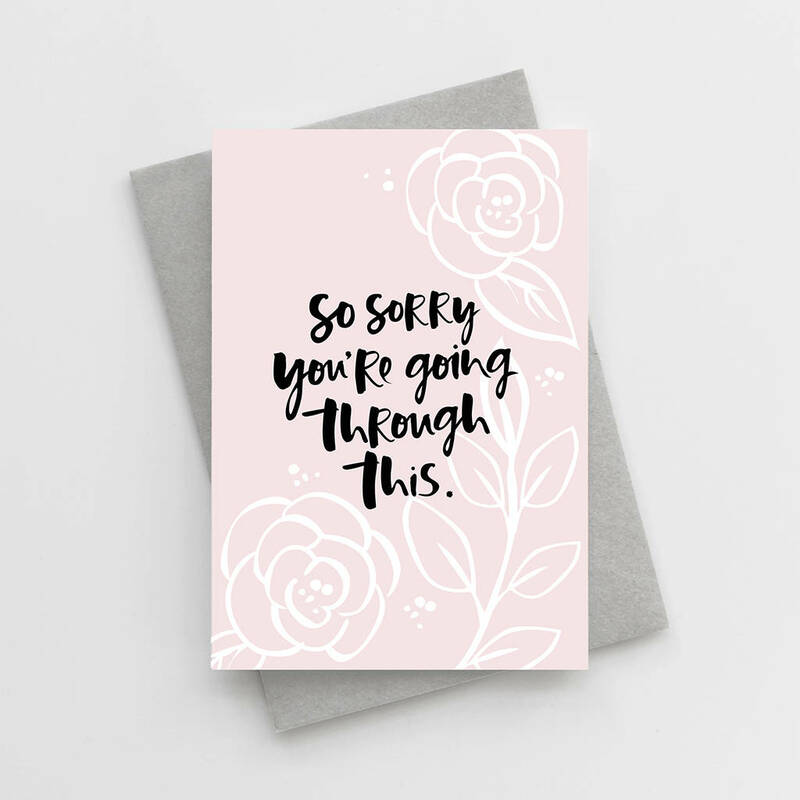 Featuring our classic, hand lettered typography, the phrase 'So Sorry You're Going Through This' is written in deep black ink, layered over a soft, blush background and finished with a hand illustrated floral design. This card would make a lovely modern sympathy card or get well card. Our unique, contemporary and eye catching designs are printed on luxurious, eco-friendly, textured card and teamed with a recycled grey envelope. Our cards are blank inside for your own message. Our cards are printed on to luxuriously textured, FSC Certified, 350gsm Card and teamed with a recycled 120gsm envelope. Each card is individually wrapped in a protective, biodegradable cello sleeve and finished with a silver sticker. 'So Sorry You're Going Through This' Sympathy Card is 10.5 x 14.8cm (A6) and comes with a 11.4 x 16.2cm (C6) envelope. This product is dispatched to you by Too Wordy.